Whether it’s the maroon of Missouri State or the bright red of the Cardinals, uniforms help identify and unify a team. While they won’t be running the bases or scoring touchdowns, co-workers at Mercy Hospital Springfield and the surrounding Mercy clinics will be sporting new uniforms beginning today. 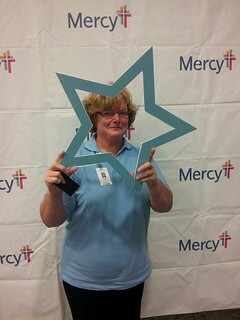 After months of studies, photo shoots, presentations and start-overs, Mercy chose scrubs with a base color of black, accented by vibrant colors of the new Mercy logo which each co-worker chooses for him or herself. The Mercy Experience Team led the effort. It coordinates advisory groups, one-on-one interviews and other research so Mercy decisions are made with the voice of the patient, the co-worker and the community member in mind. Co-workers from across all four states Mercy serves gave input on the kinds of pockets, clasps, colors, fabrics and styles they prefer in work apparel. To get all existing Mercy co-workers suited up and ready for this new look, Mercy provided an allowance to get their uniform wardrobe established. Co-workers can purchase additional sets of scrubs just as they always have. The Mercy scrubs, known internally as “M-Wear” will be available for purchase at 25 percent less than retail prices for the same brand scrubs. Mercy is organizing a used scrubs donation program, so co-workers have an easy and philanthropic option for their gently used threads. Donated scrubs will be shipped to a group of hospitals in Rwanda, which Mercy partners with on several programs.